Abang Johari (sixth right) flanked by Manyin (on his right) and Dr Jerip (fifth right) leading others in tossing the Yee Sang. SIBURAN: Siburan sub-district may be elevated to a district if the area meets the conditions required for it to be upgraded. Chief Minister Datuk Patinggi Abang Johari Tun Openg said he will talk to State Secretary Tan Sri Datuk Amar Morshidi Abdul Ghani and Serian Resident to form a task force find out if the sub-district can qualify to be a full-fldged district. “I am taking note on the request for Siburan to become a full district and we will study the request because there are several criteria to be met. 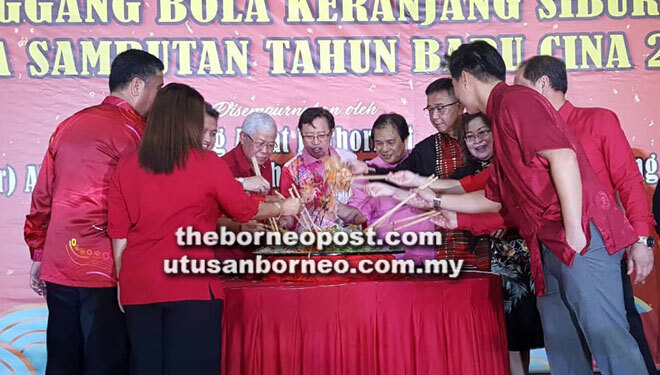 “As such, I will ask State Secretary and the Resident to form a taskforce to upgrade Siburan sub-district to become a full district,” the Chief Minister said when officating at opening of a basketball court here last night. A Chinese New Year gathering was also held in conjunction with the official opening of the basketball court. Abang Johari approved RM1.5 million to upgrade the Siburan sub-district office. The chief minister also instructed Mambong assembly-man Datuk Dr Jerip Susil to find a green area to set up a recreational area in Siburan for the sub-district to meet one of the criteria to be elevated to a park. Earlier, Dr Jerip,who is Assistant Minister of Transportation said the people in the sub-district have requested for the elevation of the sub-district to a full district.